When Eddie Flemke and the #79 Hillbilly Racing team of Roger and Sandra Hill announced their separation three weeks before the start of the 2005 NASCAR Whelen Modified Tour season, there was shock among Tour observers. The pairing finished second in points last season and won 13 races in their seven seasons together. Picking up the pieces wouldn’t be easy. As news of the split came out, Flemke vowed to be at the season opening Icebreaker no matter what. Nobody doubted that since with Flemke’s contacts and stature in the sport, he would be able to find someone’s car to drive in a thrown together deal. Flemke will be at Thompson, but it’s not going to be in a stop gap car. Instead, he has plotted out a new beginning in his career that will involve driving the #10 car of Gary Teto for the full 2005 season – and likely beyond that. The car number has special significance to Flemke since his father, Modified icon Ed Flemke, spend the closing years of his storied career driving the #10 Manchester Sand and Gravel car and long time fans of the sport can remember that. Sadly, one of the people who the new number might mean the most to is not going to be around to see it race. Bill Thornton, the former car owner of the #10 driven by Flemke, Sr., passed away as Flemke, Jr. was completing his new deal. He died on Sunday, March 26th, just two days before Flemke announced his new ride. Speculation was that Flemke’s options in finding a new ride were limited because of his day job. 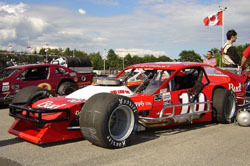 Flemke is partners with Reggie Ruggiero in Raceworks, a Connecticut based chassis builder. It was thought that Flemke would only be able to drive for a team that used Raceworks equipment. Although that was definitely preferred, it would not have been a deal breaker either. Teto’s team does use Raceworks chassis. When news of Flemke’s departure from the Hillbilly team spread, he received plenty of support fromt hose in the Modified community. Offers of ride and equipment were made from several different sources, but what meant the most was just the simple show of support that Flemke got during a rough time. The #10 team did not take part in last week’s pre-season practice session at Thompson Speedway (CT), but there isn’t much to read into based on that fact. Flemke has never really been a fan of testing too much and almost certainly wouldn’t have been there if he was in his old ride either. Flemke expects a little bit of an adjustment period, but does not think that it will take long for the new team to get used to each other. And Flemke still has a role himself in the victory. Flemke and Christopher have had run-ins on the track in the past. Nevertheless, Flemke respects the ability of his rival. 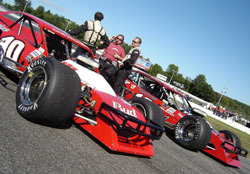 Caraway Speedway was also the first track that the #79 team visited in the post-Flemke era. Two weeks ago, Ted Christopher drove the car to victory in the opening race of the NASCAR Whelen Southern Modified Tour. Flemke was neither bitter or surprised with his result. And part of being thrilled involved making a phone call that could not have been an easy one. Flemke, the Hill team [with new driver Mike Christopher] and the rest of the NASCAR Modified Tour competitors will kick off their season this weekend with the running of the Icebreaker at Thompson on April 9th-10th. 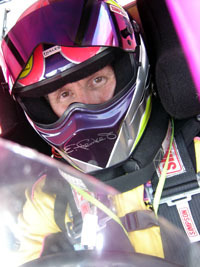 Speed51.com will have extensive team coverage of the event.